According to the head of the works Tatiana Volova, Professor of SibFU and the Head of Laboratory in the Institute of Biophysics KSC of SB RAS, development of a new generation of drugs with the use of bio-decomposable materials which decompose under the influence of the microflora to innocuous products and provide a gradual release of the active principle into the soil, is the newest area of research in the field of agriculture. For example, nitrogen is one of the elements, which is often lacking for the growth and development of plants. Plant-available nitrogen in the soil is usually small. Moreover, its compounds are chemically very mobile and easily leached from the soil. In this connection there is the task of developing such forms of nitrogen fertilizers that provide slow release nitrogen and the constancy of its concentration in the soil. “”The key point for the development of such drugs is the presence of environmentally safe and bio-decomposable material. We have developed and implemented the technology for the synthesis of bio-decomposable polyesters of microbiological origin, is effective as a material for products for biomedical applications, and also explored patterns of their decomposition in soil and other environments”” — says Tatiana Volova. 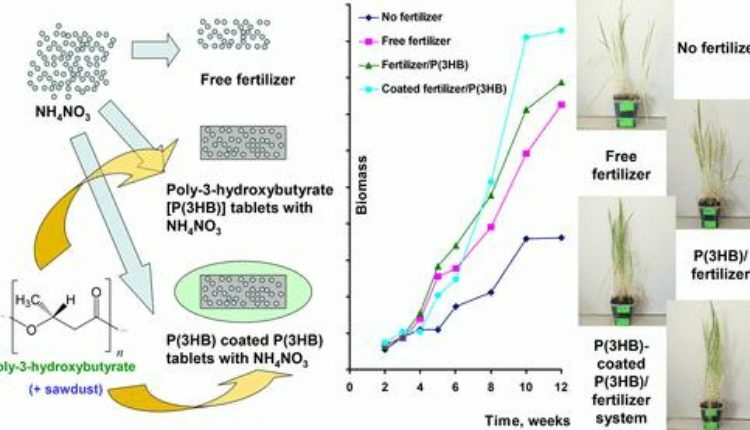 To create a slowly decaying structures, the researchers used a biodegradable polymer called poly-3-hydroxybutyrate (?3??). Scientists mixed powder of the biopolymer with wood flour and ammonium nitrate. The resulting mass was pressed into tablets and used in the experiments with wheat. 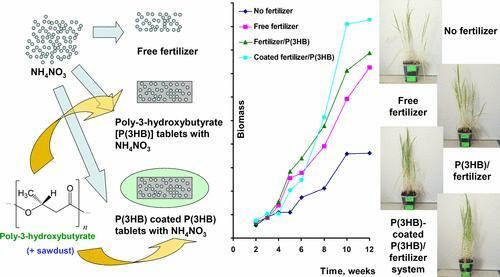 Disintegration of biodegradable tablets with the addition of ammonium nitrate. It was tested several options for fertilizing plants. Wheat was grown without fertilizers, with the addition of pure ammonium nitrate, with the application of pressed pellets or tablets, optionally coated with a film layer of biopolymer. The best results were achieved when fertilizing Packed in double protection, when the core of the tablet, including fertilizer and ?3?? (and in some cases wood flour) covered with a polymer film. In this case, due to slow decomposition of the film and the tablet fertilizer was supplied to the soil with the relatively stable rate within two months. Biomass of wheat in an experiment with a hard Packed fertilizer was the highest and nearly a quarter exceeded the biomass of wheat grown with the addition of normal fertilizer.